When creating a Program for a Package, there are essentially two Environment options for how the Program run – with the user’s rights, or with administrative rights. Using administrative rights will cause the program to run the command line under system context (svchost). I recently needed to test an install (when running under system context and when running from the SCCM server) as I was unable to visually see the behavior first hand (e.g. errors). To do this type of testing, follow these simple instructions. Enter “time” and get the value. Then change to new driver letter and then to the directory. From there you can launch whatever .exe, .msi, script, etc, that you need visually see. I used this process to confirm that executables and .msi files were being blocked with an Open File – Security Warning when running from a server share. 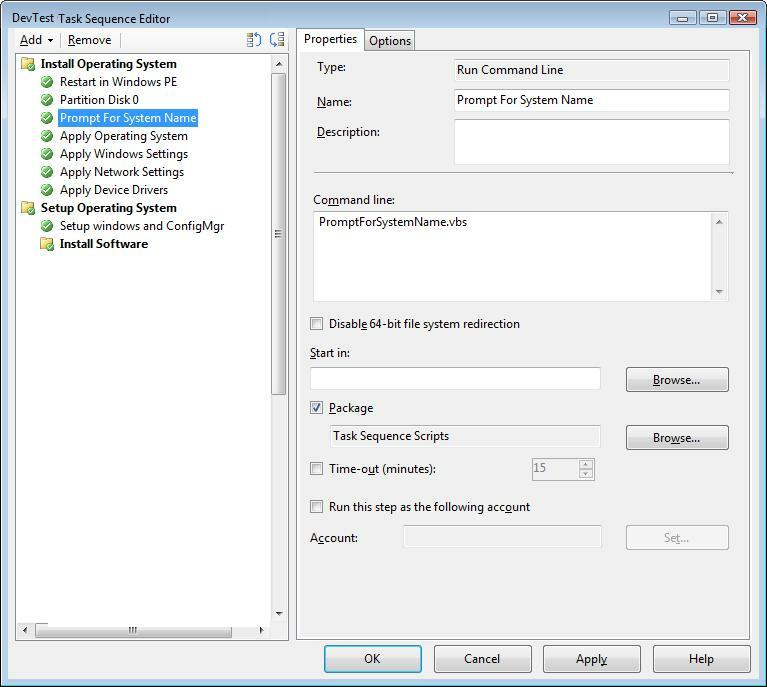 This entry was posted in ConfigMgr 07, How-To, Troubleshooting. Grasping how to peforming an unattended cleanup can be tricky. The first thing to understand is that selecting the various caches (Internet files, temporary files, trash, etc etc) is controlled through a “sageset”. You can think of a sageset as the configuration number which inidicates what diskclean should remove. So one could have a sageset which cleans up only trash, another sageset which cleans up trash and internet files, another sageset which cleans up all items except memory dump files, etc etc. This sageset are DWORD values in HKLM\Software\Microsoft\Windows\CurrentVersion\Explorer\VolumeCaches\ in each subkey. For example, I want to cleanup only Internet Cache Files and assign sageset 99 to it. Within subkey “Internet Cache Files” I create the DWORD value name StateFlags0099 and give it the value 2. Then to cleanup this item, I simply run cleanmgr.exe /sagerun:99 – That’s it! To add more items to the sageset, all one needs do is add that StateFlags0000 (where the zeos are the sageset number created). If oExecRun.StdOut.ReadLine = "Analysis Report                     " Then 'extra spaces after report are critical! One thing that I do with my deployments is to log everything SCCM installs (on a workstation) into a custom log. This makes it easy for others to know if something is being installed, did install, when it installed, in what order installed, and if it keeps reinstalling when it shouldn’t be. So when someone asks “What is SMS doing to my computer?” (which is usually asked when SMS/SCCM is not actually doing anything at all), I can then point them to that custom log file to see the proof. I have long wanted to begin blogging my IT experiences with SMS 2003 and SCCM 2007. With the frequent busyness of work, I kept putting it off….all the while I have had many things that I’ve wanted to share so that I can remember for the future.